Around 1,500 years ago, shortly after the collapse of the Roman Empire, a baobab tree started growing in what is now Namibia. The San people would eventually name the tree Homasi, and others would call it Grootboom, after the Afrikaans words for “big tree.” As new empires rose and fell, Homasi continued growing. As humans invented paper money, printing presses, cars, and computers, Homasi sprouted new twigs, branches, and even stems, becoming a five-trunked behemoth with a height of 32 meters and a girth to match. And then, in 2004, it collapsed. 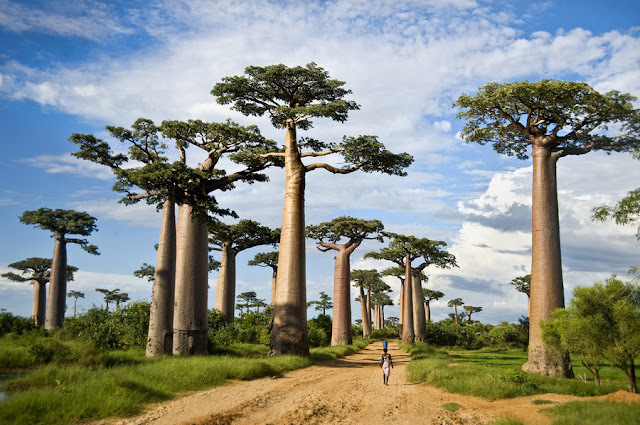 Baobabs often have hollow trunks, with huge internal cavities that humans have used as shops, houses, chapels, and even prisons. When trees are hollow, it’s usually because the wood inside them has died. But baobab hollows were never filled; instead, these trees periodically produce new stems in the way that other trees sprout new branches. It’s the stems, fused together in a ring, that form the hollow space. That’s why the cavity is lined with bark, and shrinks with age. More at NPR (whence the embedded photo) and at The Guardian.